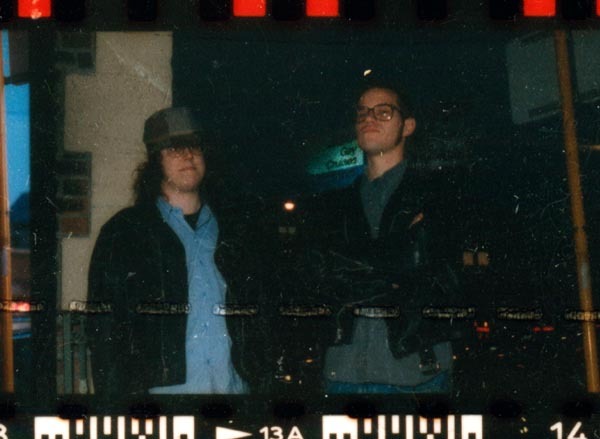 PICTURED ABOVE: Rob Syers and Mark Fischer, circa 1992, tryin' to look tough in front of the "Gay Cruises" billboard near the intersection of Clark and Belmont in Chicago. There's an awful lot of history to wade through and it's gonna take a while til we have the definitive story down. In the meantime, be sure to check out the archive of News found at the News Desk page (dating all the way back to 1993! ), the SKiN GRAFT Comix COVER GALLERY at the Electronic Comics Page (to see SG's humble beginnings as a self-published comic!)... and for even more inside scoops, check the "Fun Facts" found with many of the record descriptions in the Catalog. To add a bit more to the story, here's a brief interview with SKiN GRAFT "Editor In Chief" Mark Fischer from Spring 2000. 1. when did skin graft begin releasing material (either music or comic books)? what was the first release? >>> SKiN GRAFT COMiX #1, came out in 1986. It was a copy shop job that my friend Rob Syers and I put together in high school. The first record was a split 7" with Dazzling Killmen and Mother's Day. It came out at the tail end of 1991 - there were 500 copies of that one. 2. What inspired you to start the label? did you start it alone? >>> Dazzling Killmen asked if I wanted to do some comics for a seven inch that they were doing ---and we ran from there. Rob wasn't really interested in doing a record label, but he contributed comics and art to a lot of the early releases and is always working on amazing new stuff. 3. why have comics always been an integral part of the label and its artwork? >>> Skin Graft is a comic book company that puts out records. 4. is there a specific aesthetic or idea you've had in mind for what sorts of bands you want to have on the label? >>> Just follow Stan Lee's blueprint and Jack Kirby's work ethic. Above all - keep it fun and not play it too safe. I've tried to keep the label diverse, and I think it's consistent. The bands must take credit for pushing themselves to innovate. 5. What are some of your reasons for passing along the american end of skin graft to brian peterson and leaving to head things up in europe? >>> I'm getting married and my girl lives in Vienna. Even if I wasn't leaving, Brian would still be here. Brian's cool and I'll have more time to do other stuff. I'll be in Chicago from time to time and will work from an office over yonder. 6. how do you handle signing a band to skin graft? do you attract prospects to the label, or do bands approach the label itself (ex. arab on radar)? >>> Arab On Radar sent skin graft some stuff years ago. When Weasel started recording them, he turned me on to them and let me know that they were for real. They played a great living room show in wicker park and they blew the roof off of the party. I seriously started talking to them when they did some east coast shows with Colossamite. It's casual. 7. what kind of support do you offer your bands (i.e. tour support, promotions, cost of recording, studio time, etc.)? >>> Lot's of moral support. 8. are there any albums, not on skin graft, that you wished you could have released? >>> DRI "dealing with it"